Members of the Hazelwood Youth Media Justice Program attended the Youth Undoing Institutional Racism (YUIR) Weekend Preview on Thursday, June 11th at the Kingsley Association. Dustin Washington led the event. He is the Director of Seattle’s Community Justice Program, an anti-racist organizer, and a core trainer with the People’s Institute for Survival and Beyond. The upcoming YUIR Weekend (October 9-11) is the Pittsburgh pilot launch of a free 2-and-a-half day anti-racism training for high school and college-aged youth. 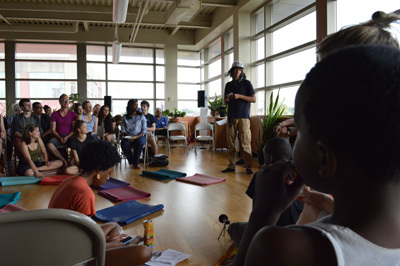 Watch this clip to learn more about YUIR Weekend’s anti-racist youth organizing philosophy.